No other Swedish town is as closely associated with ceramics as Höganäs. Kilns have been fired here for nearly two hundred years. Höganäsbolaget built its first kilns here in 1825. These kilns were fired with coal from local mines. Founded in 1909, Andersson & Johansson eventually became world renowned under the name Höganäs Keramik. Modern household wares manufactured here have assumed a rightful place in Swedish design history. Well-known designers have included John Andersson, Hertha Bengtson and Signe Persson-Melin. Numerous independent artists and potters have also helped to establish Kullabygden’s reputation as a centre of Swedish ceramic art and design. 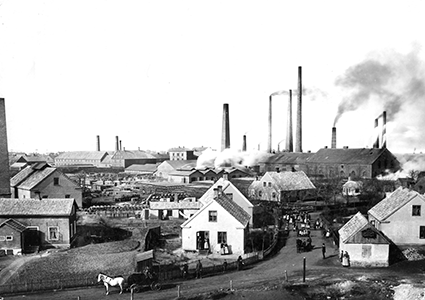 In 1832 a four-year-old brickworks at Höganäsbolaget was converted for production of decorative and household wares. Three years later the first salt kiln, propped with stoneware, was fired. Essentially, however, manufacturing of heavy industrial ceramics carried the company through the 1800s and much of the 1900s. Products included refractory brick for the iron and steel industry, salt-glazed stoneware for the chemicals industry, building brick, and ceramic piping for water and sewers. But art has a lasting appeal. We recognize and remember it. Production of tableware crockery and ornaments was something of an interlude in the history of Höganäsbolaget, and it was phased out during the 1920s. And production of salt-glazed household wares was reduced in 1954. However, Höganäsbolaget has been instrumental in the growth of a ceramics district. Of the three remaining stoneware factories in the district, only Wallåkra and Raus still fire their kilns with coal according to the old method. In Höganäs there were at most ten coal-fired salt-glaze kilns. Today, there is one gas-fired kiln. The large Höganäs kilns held 6 tonnes of ware. The kiln was fired with 10 tonnes of coal for three days. Every twenty minutes, the fireman would shovel coal through the ten ‘mouths’. Towards the end of a firing, when the temperature had reached 1,280 degrees Celsius, 175 kilograms of salt was thrown into the kiln. The kiln was then allowed to cool slowly. Salt consists of sodium and chloride. In the heat, the sodium reacts with substances in the clay to form a clear glaze. The final colour of the vessel depends on the composition and iron content of the clay. Legend has it that, when they started in 1835, the Höganäs potters did not understand the secrets behind salt glazing. A couple of men were sent to the factory in Helsingborg to spy. But there, the doors and windows were well locked and barred. On their next attempt the Höganäs men succeeded in bribing the Helsingborg potters with liquor, and thereby extracting from them the secrets of the process. The salt-glazed crock has a timeless shape. This model is strongly associated with Höganäs but has been manufactured in many other locations. The clay determines the colour of the vessel – salt glaze is colourless and transparent. These were made at seven factories in Skåne: Helsingborg, Höganäs, Wallåkra, Raus, Ystad, Skromberga, Olofsson & Johansson. Like Staffordshire in England, Höganäs has become synonymous with ceramics. The name Höganäs has the status of a brand. Both names denote areas in which there have been many ceramics factories and pottery workshops. Several of the companies have been interrelated. Others have been started by former employees. Some are fully independent. Local access to raw materials – coal and clay – laid the foundations for development. Eventually, artistic ability and technical know-how became the most important assets, knowledge that was increased, refined and passed on. Production of stoneware in Höganäs embodied a modern industrial approach, where design, serial manufacture, marketing and distribution were the keys to success. The products also expressed a new and international design language. They therefore differed in many ways from items originating in the local, southern Swedish pottery tradition. Designers including Ferdinand Ring, Helmer Osslund, Albin Hamberg and Edgar Böckman worked at the stoneware factory. Salt-glazed ceramics are durable and resistant to many chemicals, for example, strong acids. Höganäsbolaget’s acid-resistant vessels and pipes therefore played an important part in the country’s industrial development during the 1800s and 1900s, before stainless steel and plastics were available. High-quality refractory brick is still manufactured by Höganäs Bjuf AB, in Bjuv. It is used in, among other sectors, the steel industry. The salt-glazed ox head is both decorative and informative. It may have marked the entrance to a cowshed on a large farm or estate with a cattle herd. In 1909 two entrepreneurs left Höganäsbolaget and opened a new workshop north of Höganäs harbour. At Andersson & Johansson, later known as Höganäs Keramik, rustic and modern household wares that would assume a self-evident place in Swedish design history were manufactured, first in clay and, from 1970, in stoneware. In 1943 Andersson & Johansson moved into these premises. The building was purpose-built and the original pottery workshop became a modern factory. Although production was fast-paced, items were hand-crafted up until 1970. Here, the pottery wheels have turned many million revolutions. Höganäs Keramik, now part of the Fiskars Group, is still here in the building. Since 2008, production has moved abroad.